Max the hyper backgammon AI wants to play with you! Championship Backgammon impresses in just a few ways; it's main and most interesting aspect is that it has a really skillful and always unexpected AI that can really play the game. 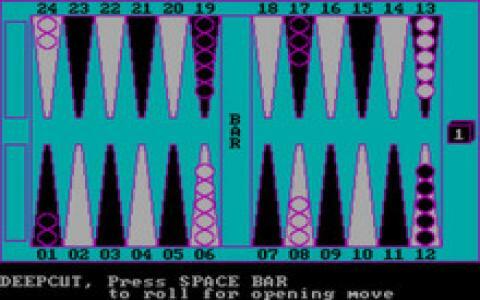 Because the rules of backgammon are the way they are, it is rather hard to create an Ai that doesn't feel like it's following a prescribed type of path. There is a dice roll after each move, and a unitary strategy, for the game, has to keep in mind the probability that the numbers you want to get out of the dice might not actually emerge. And so, it is easy to see in a classic Ai, that it is generally calculating the odds in a very fixed, non human player way. Well, not Championship Backgammon; this one has a smarter kind of math being it. Yet, graphically, it is a rather old and tired game, but, once you grow accustomed to the AI, and know that your actual games are going to be super, that won't matter. So, even today, Championship Backgammon can still put up a cool, mighty fight, and for that you should definitely give it a go. Else, download Backgammon Professional, which is both very polished graphically and features a great AI too.